I'm quite sure that Ms. Irene Adler, the only woman ever to outwit Sherlock Holmes, had a mini cape trench like this in her wardrobe. With Victorian modesty and modern lines, the aptly named "Lady Stevens Cape Trench" is perfect for practicing wit and wiles on a rainy day. ($275) Wear with lace up shoe booties, a pencil skirt and frilly silk blouse. 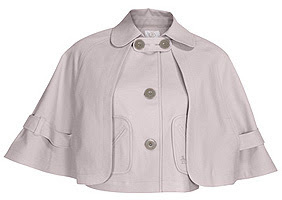 i just sold one like that to a T on ebay for like 20$ from banana republic.. it was nice but didnt wear it much..